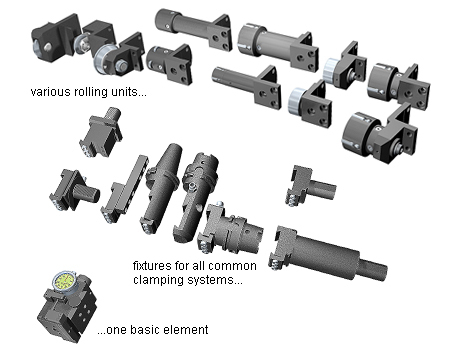 Modular single-roller tools are reliable precision instruments. The modular design makes it possible to process nearly all smoothening and work hardening tasks. The tools can be used on lathe machines, both CNC and conventional. The fixture connects the tool to the machine. Fixtures are available for all common clamping systems. 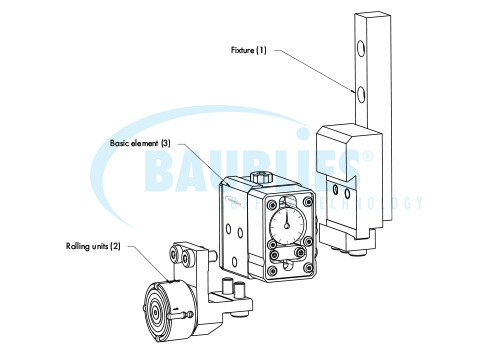 Due to the modularity of the tool system the fixture type can be replaced in very short time. During the rolling process the rolling unit guides and supports the roll. The rolling unit is fixed to the basic element. A variety of rolling units is available. The basic element can be used for rolling external and internal contours. Therefore the direction of the spring load has to be reversed. This is done by setting the adjusting knob into the designated Position.